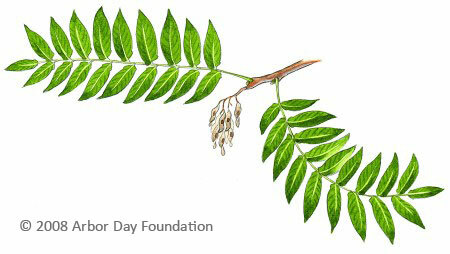 Ailanthus altissima has many different names, including tree-of-heaven, stinktree, and Chinese sumac. In Chinese, the tree is called chouchun, which translates literally as “foul smelling tree.” Whatever you call it, this invasive tree has become a big problem in our region. Originally from China and Taiwan, it proliferates and grows rapidly, often before people realize that it is a problem. Learning to identify this invader is the first step in controlling its spread. Tree identification in general can be a complicated and sometimes difficult process. Luckily, tree-of-heaven has a few very obvious characteristics that can make recognizing it easier. The leaves of Ailanthus are a great way to identify this problem tree. The leaves can grow to be 1 to 3 feet long and are compound, meaning that each leaf consists of a number of leaflets. 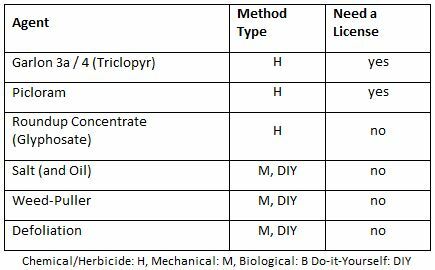 In this case, the compound leaves have 11 or more pointed leaflets. 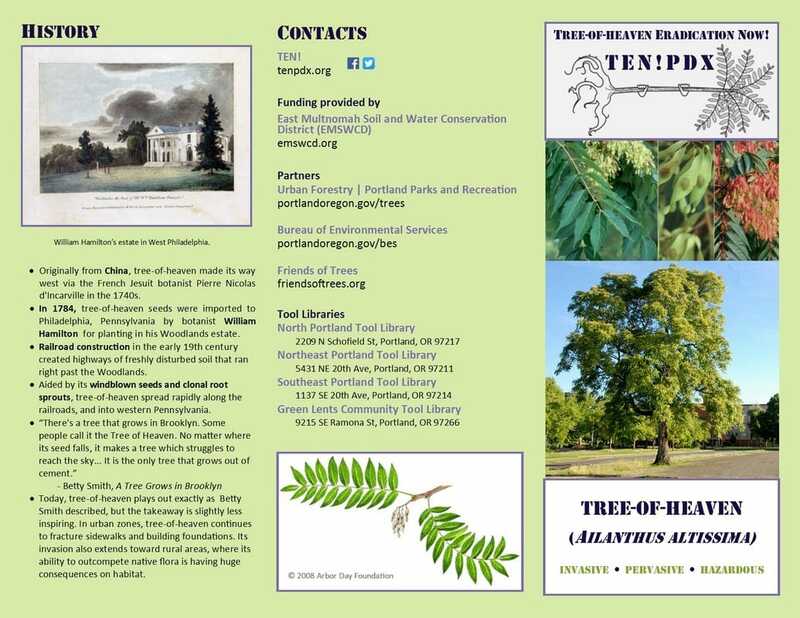 The pointed shape helps to differentiate tree-of-heaven from other trees that grow in our area that also have compound leaves. 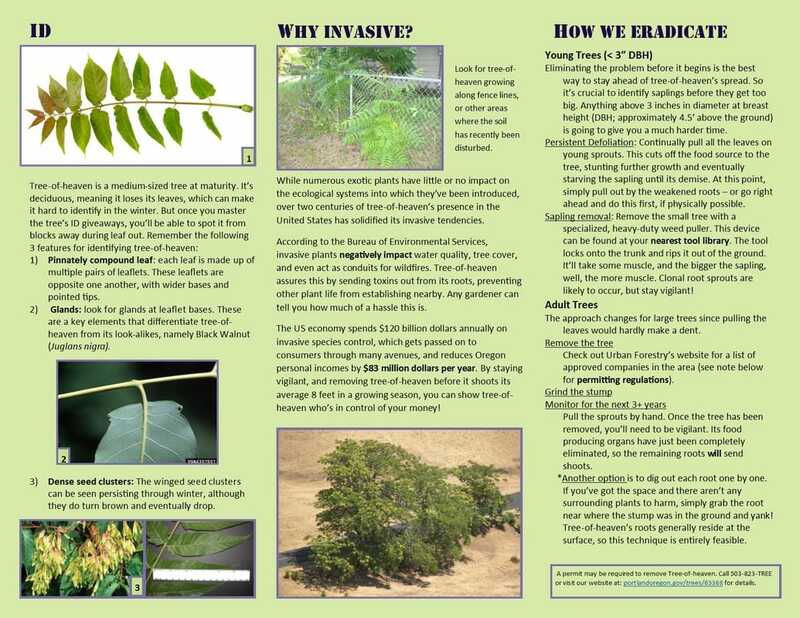 Taking a closer look at the leaflet’s shape will prevent confusing Ailanthus with black walnut (Juglans nigra). The leaflets have an unequal base with two to four teeth. These teeth often have one to four glands. These glands help to give tree-of-heaven its unpleasant aroma. With or without its leaves, the smell of broken tissue of this species can be a clue as to its identity. The smell can come from the glands at the base of the leaves, but also from broken twigs. This means that the smell can help to identify this species all year long. Some people describe the smell as rancid peanut butter or well-loved gym socks. However you describe the smell, Ailanthus lives up to its Chinese name. During the winter months, the bark and the leaf scars are the best ways to identify tree-of-heaven. The bark can be light brown to grey, and smooth in young trees. In later years, the bark turns a darker grey and becomes ruff. The leaf scars result from the tree dropping its leaves, and are located where the large leaves attach to the branches. They are characteristically heart shaped, due to the shape of the leaf base. The seed clusters of this species can be another indicator to determine species. 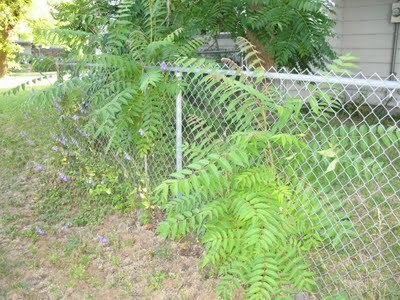 Tree-of-heaven is very prolific, and a mature females can produce between 300,000 and 350,000 fertile seeds each year. This is part of the reason that this species spreads so rapidly. The seeds are twisted samaras, or winged shaped. They are similar to the seeds that maples produce, but are single seeds versus the maple’s dual seed samaras. They often turn a reddish color as they mature, and are clustered in large groups. The seeds are dispersed during the winter months, so they are a good way to identify this Ailanthus once it has lost its leaves. 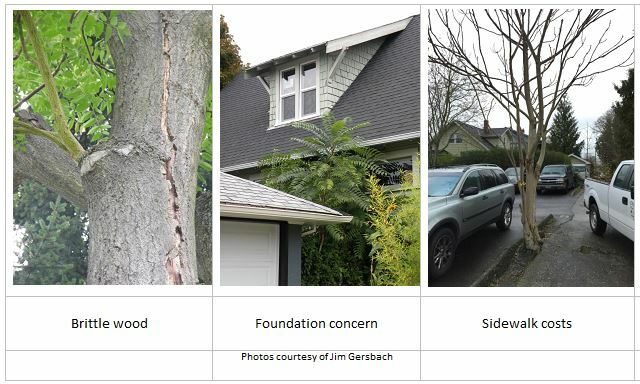 You can use the characteristics to identify Ailanthus, which is the first step to controlling its spread, and therefore the damage that it can do to both urban and natural areas. 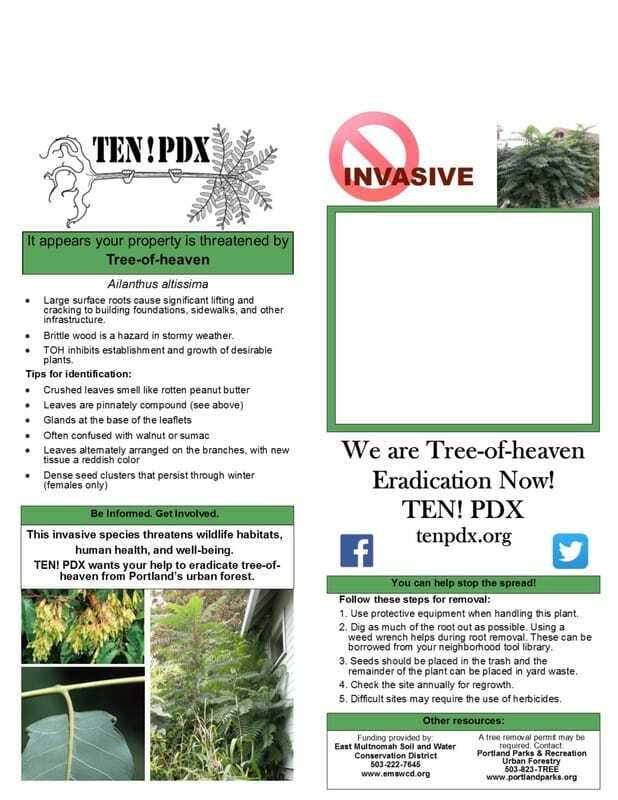 Keeps an eye out for a second post about tree-of-heaven, with a focus on control methods.